Canadian banks continue to funnel money into the historic real estate boom. In the first quarter of 2017, Canadian bank loans to the real estate and construction sector hit a record at C$43.6 billion. 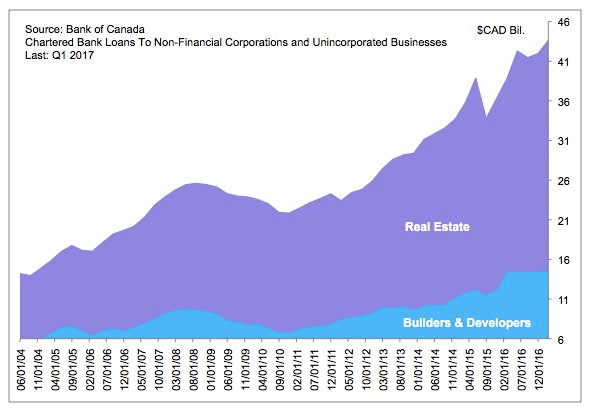 Canadian Bank Loans to Real Estate & Construction. To no surprise, Mortgage payments for new loans in Vancouver are up 4.5% year over year. Coincidentally prices continue to rise, Vancouver condo prices are increasing by over 2% per month with little signs of slowing. This dangerous concoction of rising home prices and household debt may finally be reaching a boiling point. It’s estimated household debt to disposable income could reach a mind blowing 180% by 2018 if the Bank of Canada leaves rates untouched. This sparked a surprisingly hawkish response from the Bank of Canada governor Stephen Poloz who is finally considering hiking interest rates. Investors are now putting a 50% chance of a rate hike on July 12, which could be the first of several rate hikes in the coming months. Expect the variable rate mortgage of 2.7% to climb in the future.